Paddle your canoe across tranquil waters. Take morning walks with Fido along the wooded tree line. Be mesmerized by views of your waterfront haven while enjoying the privacy of your oversized deck. As new owner of this log home, you will rejoice in all that nature has to offer. Calling all log home lovers. When you're going for authentic, it's all about the details and not one detail was sacrificed in the making of this Virginia log home. Absolutely gorgeous property that has been featured in "Log Home Living" magazine. From the first approach going through the private gated entrance to every corner of this fabulous property, is just a dream. 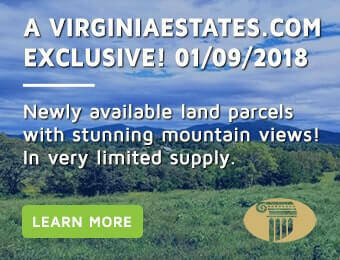 128 acres in Virginia's Northern Neck w/ remarkably built custom Satterwhite Log Cabin, Guest/Farm Manager house, large equipment barn, & numerous outbuildings. Beautiful log home, built of standing Engelmann Spruce from the Rocky Mountains, consists of an open floor plan w/ 3 beds & 3. The property consists of two tax Parcels that includes a large 2,862 SF Log Model Home, log shed and a rental (log) home built by custom log home Builder Joe Pine. Model features 3 Bdrs w/ main lvl master, 2.5 Ba including office suite with 4 private offices and reception area. Rental cabin features 3 bdrs, 2 Ba and currently occupied mo-to-mo. C-2 & A-3 Zoning. Property Sold in its entirety. Luxurious recreational retreat log home located in Fisherman~s Cove on Lake Anna. When you step into this beautiful home you will be amazed! A stone fireplace is the focal point of the great room which also has skylights, 6-inch heart-pine planks, and log beamed cathedral ceilings. The gourmet kitchen is for the sophisticated cook.